It is said that Rikyu's chanoyu entered its most successful period in the second decade of Tensho (the 1580's). One of the foundations on which this was built was the appearance of tea utensils that Rikyu designed and had made. Originally, utensils used for other purposes were selected for use in chanoyu, but Rikyu began to ask specialist craftsmen to make new ones specifically for use in chanoyu. Among these, Raku tea bowls made by Raku Chojiro could be taken to symbolize faithfully the aesthetics and spirit of Rikyu's 'wabi' (quiet simplicity). Chojiro's ancestor called 'Ameya' came from China and was originally a maker of decorative tiles. At the time it was mainly Chinese and Korean utensils that were used, along with Seto and Mino ware Japanese tea bowls, but the meeting of Rikyu and Chojiro produced Raku tea bowls ('Rakujawan'), which at the time was a completely new style. There are no concrete historical records of the relationship of Rikyu and Chojiro. However, looking at comtemporary tea records, in a tea gathering of Tensho 14 (1586) it is recorded that a 'Soekigata' (Rikyu-style) tea bowl was used. Soekigata, that is Raku tea bowls designed by Rikyu and made by Chojiro, became very popular at this time. Raku tea bowls are made by hand, without using a potter's wheel. The clay is worked with both hands, then shaped with a spatula. Working it with the hands gives a natural shape and scraping with a scapula removes the surplus clay. These two processes bring out the shape so that the ultimate tea bowl suitable in size shape colour, weight and feel for the wabi-cha that Rikyu was seeking can be made. 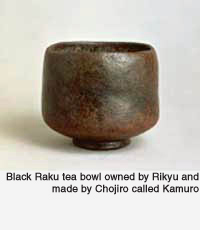 Of the two main kinds of Raku tea bowl, the black and the red, it was the black one that Rikyu particularly favoured. Hideyoshi did not like black tea bowls and had a special liking for gold as a symbol of his wealth, making a 'golden tea room' and so on. This tea room was covered with thin gold plates and gold leaf and could be folded up and carried about. Ogon no bunka ('golden culture') became one of the special features of the Azuchi Momoyama period. The difference in taste with regard to colour was perhaps an element in the antagonism between the two men. Rikyu's creation of utensils also extended into the fields of kettles and flower containers.